The BJP fought with Republican Party of India (Athawale), while the PWP had a tie-up with the Congress and the NCP. 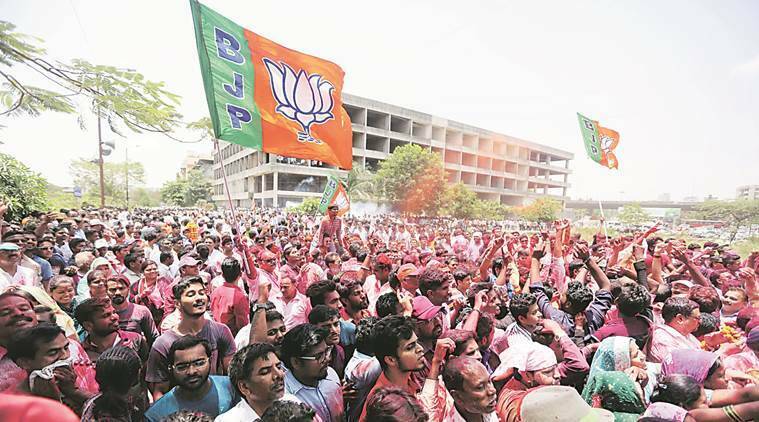 BAGGING 51 of the total 78 seats in the newly formed Panvel Municipal Corporation, the Bharatiya Janata Party (BJP) continued its winning streak in urban local body polls across Maharashtra. The Panvel region near Navi Mumbai has for long been dominated by the Peasants and Workers Party (PWP) and the Nationalist Congress Party (NCP). While the election was being seen as a close contest between the BJP and the PWP — which has a committed voter base in the region — the saffron party won the polls with a convincing majority on Friday. The BJP fought with Republican Party of India (Athawale), while the PWP had a tie-up with the Congress and the NCP. The Shiv Sena with ally Swabhimani Shetkari Sanghatana contested separately. Apart from the BJP’s 51 seats, the PWP won 23 seats. Two each were picked up by the Congress and the NCP. The Shiv Sena could not open its account in the newly formed civic body. Prashant Thakur, the local BJP legislator, said the complete majority in Panvel was the result of the development work undertaken by Prime Minister Narendra Modi and Chief Minister Devendra Fadnavis. The result came as a big setback for the PWP, as it was expecting to win the civic body that includes rural areas. The PWP has a strong presence in the Raigad district of Konkan region, and has been ruling the local bodies and the cooperative sector here for several decades. The party on Friday alleged that the possibility of electronic voting machine (EVM) tampering could not be ruled out. “It is surprising that people have voted for corrupt leaders with criminal backgrounds.The possibility of EVM tampering can’t be dismissed. Also, some BJP leaders had told our activists of the tally they were expecting in Kharghar and Kamothe, both of which have a large PWP following. The results have thrown up the same numbers,” said Vivek Patil, a senior PWP leader. Patil further alleged that the election machinery “failed in curbing huge financial transactions” during the polls. “We are gathering details of EVM tampering and will soon lodge a complaint with the Election Commission,” Patil added. The NCP, which too has a good presence in the region, could win only two seats, despite party stalwarts such as Sunil Tatkare campaigning for it. The Shiv Sena, which has negligible presence in the area, had put up a spirited fight for the 65 seats it contested. Party president Uddhav Thackeray and Yuva Sena president Aaditya Thackeray had both campaigned for the polls. A Sena leader said it was shocking that the seats of the relatives of senior Sena leaders were also lost in the polls. “It shows that the organisation is very weak and the party needs to start from scratch,” he said.